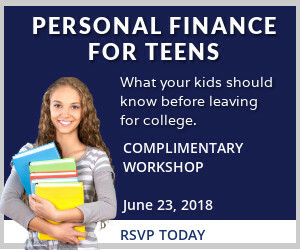 You are cordially invited to a complimentary seminar on “Personal Finance for Teens: What Your Kids Should Know Before Leaving for College” on Saturday, June 23, 2018 from 10:30 – 12:00 p.m. at our Dallas office (14180 Dallas Parkway Dallas, 75254 in the 1st floor conference room). Ensure your student and yourself are on the same page and are confident that your kids understand how to handle their finances while away from home. The presentation will provide real-world examples, be interactive and informative. The presentation is complimentary and open to all, but seats are limited. Snacks will be provided. Please RSVP online or call us at 972-692-0909 to reserve a place for you and any guest you believe may benefit from this presentation. We look forward to seeing you there.